LH: You moved to Circle B Ranch in 2009, where you and your husband started your first commercial farm. What led you to this choice? CBR: We are passionate about the food we produce and the welfare of our animals. We firmly believe that an animal’s welfare and humane treatment of the animal is vital to the taste and appearance of the meat. We are on the same page with the Slow Food movement. We considered other species for raising, but felt Berkshire hogs were a better return on investment. They are also hardy, nearly self-sufficient, and not prone to diseases when pasture raised. 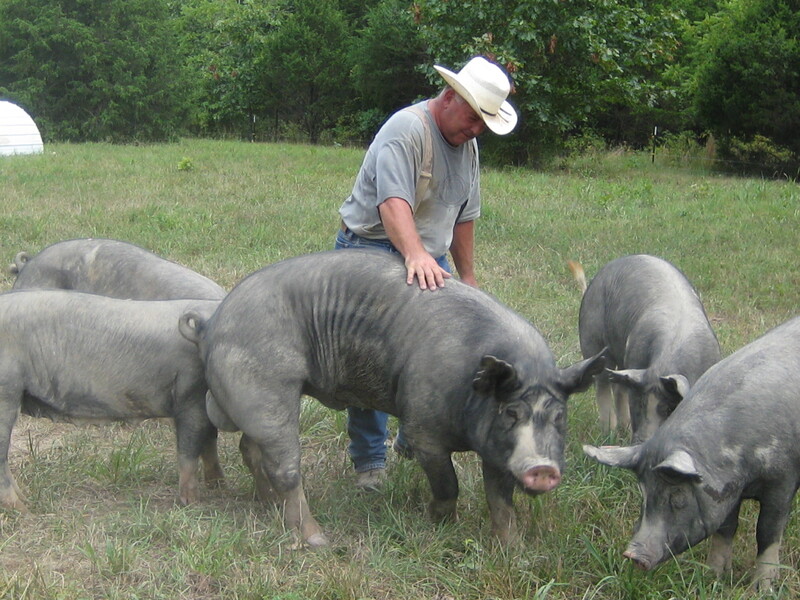 The Berkshire in particular is a docile hog, well-equipped for pasture-raising. They produce large litters and have good mothering instincts. Their carcass quality and taste are legendary. Red Wattle is also highly compatible to pasture-raising and has good maternal instincts. When crossed with the Berkshire, a whole new dimension of taste is added. LH: Why is it important to your family and business to raise certified-humane, heritage pigs in a natural, free-range environment? Generally, what do these practices entail? CBR: Since the animals are free-ranged on pasture land, they do what hogs do best—root and graze for the majority of their food. The hogs have freedom to graze on the lush pastures and roam the woods, foraging for nuts and acorns. Naturally-raised pork is rich in Omega 3 fat, Vitamin D, and free from any additional hormones and antibiotics. Circle B Ranch adds natural corn & soybean-based food with mineral and vitamin supplements to the animal’s diet. Since we manage the process from pasture to plate, the customer will immediately taste the difference. 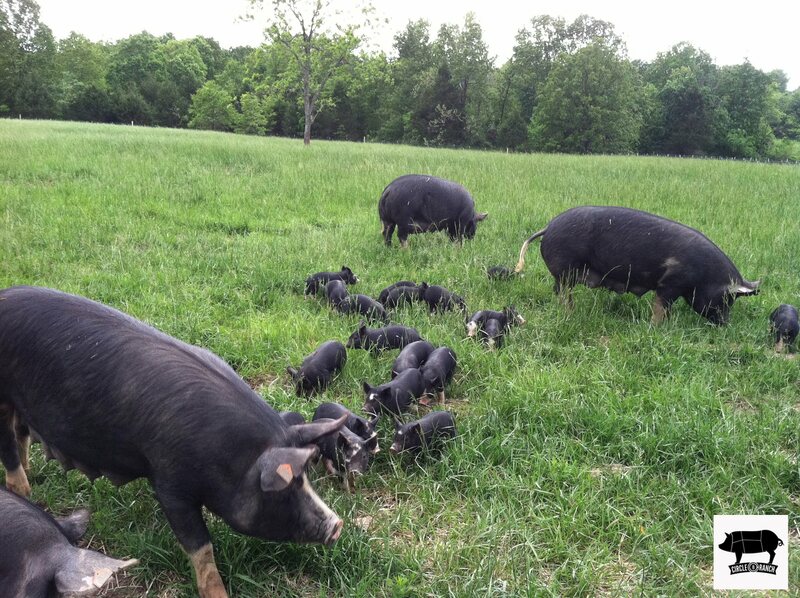 Circle B Ranch provides a clean and 100% natural environment to breed, farrow, and raise heritage Berkshire/Kurabota and Red Wattle hogs for both restaurant use and consumer consumption. We accomplish our mission by raising the hogs using sustainable and humane production methods that adhere to the Certified Humane Raised and Handled standards of operation. LH: Describe your farm’s unique aspects. How does the landscape aid your mission? CBR: The landscape of SW Missouri is very hilly and heavily wooded. The Berkshire hogs are given free access to the pasture, wooded areas, and the natural streams that run through the property. The hogs have a basic diet of pasture grass and legumes, roots, nuts (such as acorns, black walnuts, hickory), and even occasional wild persimmon. This is how hogs were raised long ago. There are only a handful of farmers nationwide who truly pasture-raise hogs. Their diet is also supplemented with discarded market fruits and vegetables collected from local food banks and markets. We feel this broad spectrum diet produces the quality product our customers enjoy. Not only does the varied terrain provide quality forage, the deep wooded hollows provide cool and shade and shelter from wind and cold, which prevents stress to the animals and thereby enhances consistent growth. LH: You raise a few different breeds of heritage hogs. What are the differences between the breeds? Do they lend themselves to different types of pork product? CBR: We raise two type of heritage hogs. Berkshire and Red Wattle. We also produce a crossbreed. The Berkshire has a very buttery nut like flavor and light “marbling’ in the loins. The Red Wattle has a longer muscle structure, very dark meat, and a “nearer to steak” taste. They have heavier marbling in the loins. The Red Wattle is also a longer and taller hog so the sides of the cross for bacon use are a little larger. The cross of Berkshire/Red Wattle produces a Berkshire taste and marbling but with a rich dark Red Wattle meat. LH: Describe a day in the life of your farm. 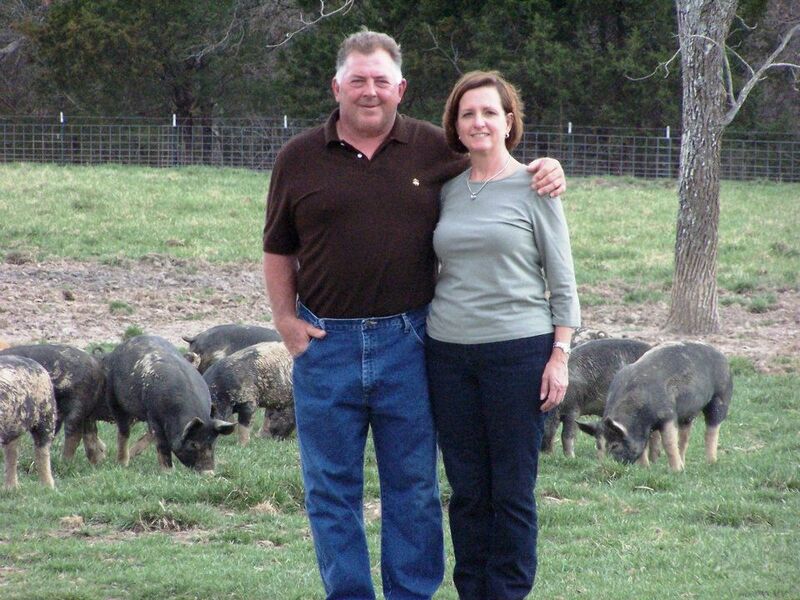 What’s it like being an independent hog farmer in Missouri? CBR: John handles the everyday nuts and bolts of the farm, with help from our farm foreman Darrell. He also controls the animal husbandry, feeding of the hogs, rotation of the different age groups of hogs to different pastures and fields. He handles the health and welfare of the entire herd while maintaining our pasture (over seeding) and infrastructure (such as waterlines and fencing). Marina is in charge of bookkeeping, marketing, and sale of the hogs and sauces. John, Marina, and Erin work the Greater Springfield Farmers Market and the Clayton Farmers Market in St. Louis. Delivery responsibilities are shared by all. Erin and Marina handle social media such as blogging and Facebook. It is very challenging to be an independent hog farmer in Missouri. As product demand increases, we need to maintain our high standards and not jeopardize the end product. Our mission is to bring to market the best product we can, humanely and sustainably. LH: You have a beautiful, accessible website and online store. As a local farm business, how do you manage the site and what benefits does it lend you? CBR: It took a very long time and many revisions to come up with a beautiful website. Our online store remains a work in progress. We manage our site, but a website developer does the actual design of the website. The website is a great place for people to go for information on our farm and raising practices. We use Facebook and blogs to keep our customer up-to-date on weekly happenings on the farm. We are transparent with everything we do. LH: You also have a line of gourmet sauces. What’s available? Do they complement your pork products? CBR: While we were waiting for our hogs to grow, we decided to develop a line of gourmet sauces. We have Marina’s Italian Tomato Sauce, Marina’s Cranberry Chutney, and Big John’s Barbecue. They were all made to complement our pork products. The cranberry chutney is fantastic on pork chops, or you can use it on baked brie, goat cheese, or with yogurt and granola. Marina’s Italian Tomato Sauce goes hand-and-hand with Marina’s Italian meatballs. In the meatballs, the pork is from our hogs and the beef is from Missouri Beef Growers—a coop in SW Missouri. LH: What is your favorite local product? CBR: As we all know, our food–both quality and supply—is in crisis. Patronizing an authentic local farmer will ensure a steady supply and growth of a healthy food source. Commercial providers have begun to employ clever wording and packaging to confuse consumers into a sense of trust in their claims when their growing practices have not changed. The words “Natural Raised” and “Organic practices” are being misused. We all know how pleased we are to read or hear the word “organic” when in actuality it means very little regarding an animal’s raising and treatment. Patronizing your local farmer is push back against false marketing schemes of substandard food and will serve to raise the quality standard.